Meet The Classroom Of The Future : NPR Ed When a computer runs a classroom, is it more efficient? Do kids learn more? A middle school in New York is finding out. 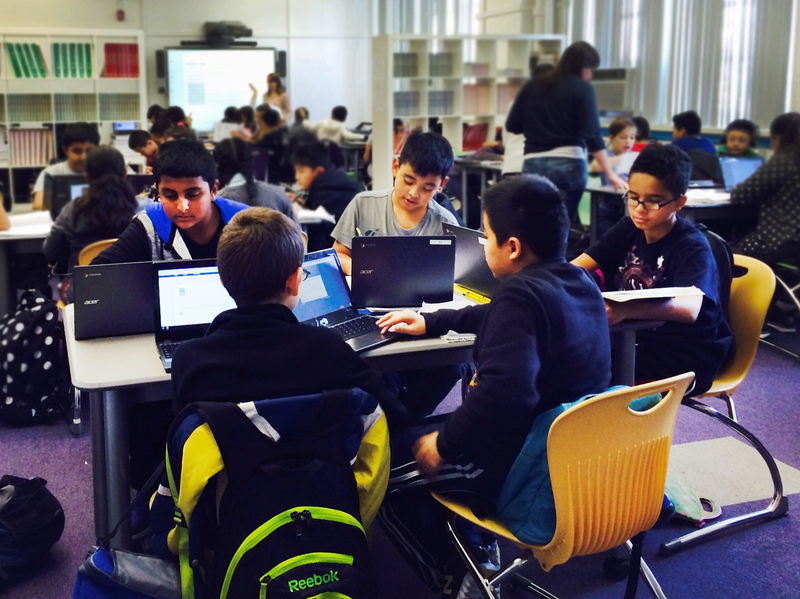 A blended learning classroom at David Boody Jr. High School in New York City. The classroom of the future probably won't be led by a robot with arms and legs, but it may be guided by a digital brain. It may look like this: one room, about the size of a basketball court; more than 100 students, all plugged into a laptop; and 15 teachers and teaching assistants. This isn't just the future, it's the sixth grade math class at David Boody Jr. High School in Brooklyn, near Coney Island. Beneath all the human buzz, something other than humans is running the show: algorithms. The kind of complex computer calculations that drive our Google searches or select what we see on our Facebook pages. Algorithms choose which students sit together. Algorithms measure what the children know and how well they know it. They choose what problems the children should work on and provide teachers with the next lesson to teach. This combination of human capital and technology is called "blended learning." And regardless of whether it makes you uneasy, the program, Teach to One, seems to be serving Boody Jr. High well. A recent study of the 15 schools using Teach to One, had mixed results, but showed they are outperforming their peers nationally on average. "It can be used as an effective tool, but so far it has had moderate and unstable effects on student performance," said Justin Reich, a researcher at Harvard who has reviewed the study. He believes Teach to One can mechanize some of the more mundane parts of teaching, like grading and assessing whether a student has mastered a topic. But, he added, it also ends up teaching to standardized tests and doesn't work better than some non-digital interventions. When these sixth graders get to class, they either log onto their laptop or check a monitor at the front of the room. 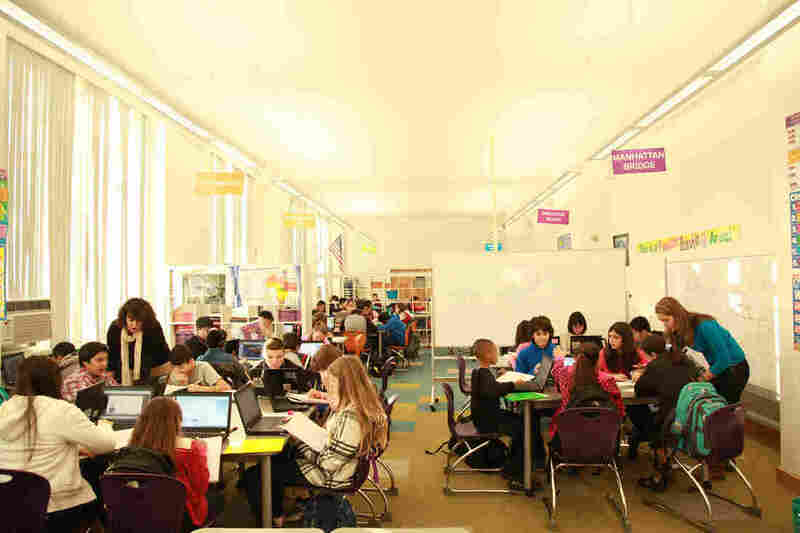 It tells each student where to go — the room is quasi-divided by book shelves and small dividers into 10 sections, with names like "Botanical Gardens" and "Brighton Beach." The computer also tells them what kind of lesson they'll do. Today, most students in the large room are engaged in individual work on their laptops, lessons called "Virtual Instruction" and "Virtual Reinforcement." Still others are engaged in group work, being led by a teacher. In "Kew Gardens," Devon Myers, who has taught for seven years, is conducting what Teach to One calls a "live investigation." He stands silently next to a smart board and clicks a mouse. A tinny voice, a cousin of iPhone's Siri perhaps, begins the lesson. "How do you say two-point-zero-five-three? To read this, break it into two parts," commands the disembodied voice from a computer's speakers. During a "virtual instruction" lesson, students work on their laptops. Myers assists: "Does anybody know how you say this?" Sabrina Giagrande, a girl who has already answered several questions, reaches her arm into the sky, like it's being pulled on and shaken by an invisible force. Myers pushes his disinterested class of 20, urging someone else to answer, but ultimately defers to Sabrina: "Two and fifty-three thousandths." "In this lesson you've learned to name decimal numbers through the thousandths by using place value," the algorithm's voice informs the class in a matter-of-fact tone. Whether they've gotten it or not, the algorithm will ultimately find out. At the end of class the kids do a short quiz called an "exit slip," which the algorithm uses to gauge what they've learned. In five questions, this exit slip gives the algorithm the information it uses to decide which students will be grouped together the next day, and what work each of them will do. In a sixth-grade class, in theory, students might be working on everything from 4th grade level math to 8th grade level math. Around 5 p.m. every day, teachers get an alert telling them how students will be grouped and what lessons they'll need to teach. Many teachers I talked with gave the program cautious praise. Aaron Kaswell, who uses Teach to One at M.S. 88, another middle school in Brooklyn, says all this sorting frees him up to be a better teacher. But he adds that helping his students learn is no easier than it was before. Since he only gets his material 16 hours in advance, that means he has to be ready to create lessons on the fly and make a plan for students who need additional help. Students engaged in group work, being led by a teacher. "You still have to make the teaching your own," he said. But not everyone does that. "A lot of people just take what's given to them [from the program] and do what they're told: 'This is my script, these are my kids who are here.'" When used that way, Teach to One won't work, he said. 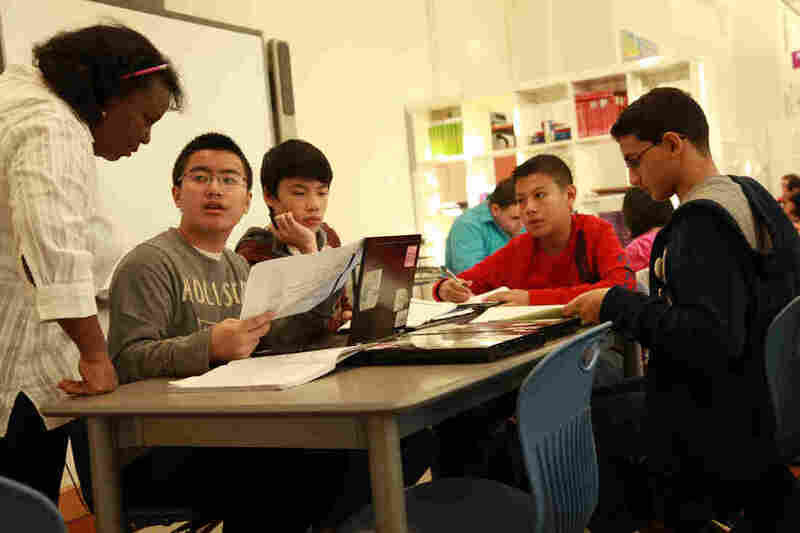 During Myers' lesson at Boody Jr. High, some students seem engaged, others appear distracted. Christien Williams, a smartly-dressed sixth grader with corn rows, stabs his pen into the rubbery flesh of an eraser with a level of satisfaction and obsession one might get from popping bubble wrap. He went over the material earlier in the period and says he's bored at the thought of doing it again. The class is divided into two 35 minute periods and during the first Christien did a "virtual instruction" tutorial. With headphones in, he went through a series of fill-in-the-blank and multiple choice questions. "In this lesson you'll learn how to identify decimals to the hundredths and thousandths," an upbeat voice says into his headphones, while a pulsing '80s synth beat plays in the background. If he answers a question correctly, it lets him move on. If he doesn't, the computer attempts to tell him where he went wrong. "Sorry that is incorrect," the voice says. "You want to write the decimal in forty and fifty-three thousandths in standard form. We will use a place value chart to answer the problem." The problem with algorithms, critics have argued, is that they make it easier to teach to standardized tests and ultimately detract from enriching teaching. Computers, for instance, are good at measuring the simplistic, computational tasks required by a standardized test, but not critical thinking, argues Reich, the Harvard researcher. He argues that has implications for the students later on: Math jobs that require a human generally involve higher-order thinking, whereas computational math jobs are already being done by computers. "If you care about children having full lives in the world of mathematics in the future, then this is a terrible system," he said. "But these high-stakes tests matter. If I were a principal and had kids on the proficiency border, I would use these programs to move them across the line." Poor test scores, in fact, were Boody Jr. High's main impetus for signing onto the program. "We hadn't made math gains in a long time. Why not try something new?" said Principal Dominick D'Angelo. Part of the success, argues D'Angelo, comes from Teach to One acting as a robotic enforcer. He knows exactly what lesson plans his teachers are going over every day and whether they got through them or not. "Go to a school on the Monday after Thanksgiving. You show me how many teachers were doing some powerful instruction," he said. "The design of this program forces the issue." In the sense that Teach to One is "adaptive" and "self-improving," it's a form of artificial intelligence, which is important because schools performed much better in the second year of the study. They performed 47 percent better on average than their peers nationally, in fact. The company's co-founder, Joel Rose, credits that to the algorithm's ability to improve itself, but also to second-year schools becoming more acclimated with the program and learning how to train teachers to better use the software. "You gotta build the plane while you're flying," Rose said of blended learning. "Luckily, we've worked with good schools that have understood that." The city had managed to raise $9 million in outside funds for the pilot program, which was set to last three years, raising another important question: Is, as many of its proponents contend, blended learning actually cheaper than traditional teaching? A recent study found, among successful programs, it isn't. Initially, blended learning costs more, agrees Rose, but he does think that once the programs get better and schools have invested in hardware, it could become cheaper one day. Aside from the money issue, the big question is this: Do kids actually learn more? Algorithms may be better task managers than people. It's likely they can reduce a great amount of a teacher's workload when grading assignments and tracking student progress. They can more easily keep pace with the changes in a standardized test. What remains unclear is the point at which standardization begins to take away from those other educational hallmarks: creativity and critical thinking. A previous version of this story misidentified the school where Aaron Kaswell teaches as M.S. 33. He actually teaches at M.S. 88. Additionally, we incorrectly said that teachers receive schedules 12 hours in advance, when it's 16 hours, and that lessons at I.S. 228, which are 35 minutes long, are 25 minutes long.